The NX Mach Series provides high-performance modeling, drafting and comprehensive assembly design powered by synchronous technology. 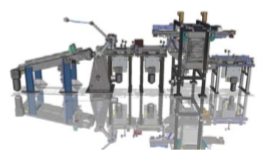 Each tier provides complete solution packages with capabitlies for production work. This entry-level solution provides capabilities for creating and editing designs of typical mechanical components and assemblies, with solid modeling and drafting, basic free form modeling and sheet metal design. It includes tools for design review, rapid prototyping, web publishing, validation checking, the new Smart Content Library and custom program execution. It also adds design-oriented stress and vibration analysis wizards. This solution delivers all the capabilities of NX Mach Designer, plus a managed environment powered by Teamcenter® software, with data management and visualization capabilities for product and process management. Mach 2 provides enhanced product design capabilities, including flexible printed circuit board design, validation checking, user-defined features, rendering and 3D annotation. Mach 3 provides the highest-performance solution with the entire range of NX design capabilities, including advanced assembly design and advanced free form modeling and surface analysis, design optimization and molded part validation.  Provides core modeling capability to support the creation of 2D and 3D wireframe models, swept and revolved bodies, Boolean operations and basic associative editing. NX uses a unique approach to 3D design that combines the power of parametric, feature-based modeling with the speed and efficiency of synchronous technology. NX combines this power with traditional feature-based modeling tools that support the creation and associative editing of standard design features such as holes, slots and pockets. Supporting a full range of parametric modeling operations, features can be located relative to any other feature or object and can be instanced to establish associative sets. Feature-based modeling also enables advanced modeling tools for blending, tapering and hollowing to create thin-wall components. Synchronous modeling works with both native and imported geometry, enabling you to directly modify design data from other CAD systems. Enables users to add design intent or knowledge on-the-fly in the form of formulas and expressions. For example, a designer may want to drive the size of a design feature using a formula or mathematical expression. DesignLogic allows rich control of design parameters both at creation time and during future editing. A powerful set of associative measurements allows a designer to not only use measurements as a tool in sizing and locating new features in the design, but also monitor critical dimensions of a design. Users can also easily add validation checks to any design parameter or associative measurement. These validation checks can be created on-the-fly or can be linked to external sources of design requirements, such as Excel spreadsheets. Validation checks help notify a designer if the value of a model expression ever strays from appropriate limits. Thus, DesignLogic helps a designer create smarter, self-checking designs that meet design requirements. Provides an interactive means to capture and store families of features for easy retrieval and editing. 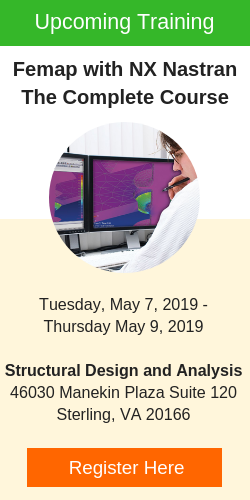 They let users take an existing associative solid model, created using standard NX modeling tools and establish relationships between parameters, define feature variables, set default values and decide the general form the feature will take when started. Existing UDFs reside in a library that can be accessed by anyone using the Features Modeling application. Supports “top-down” and “bottom-up” assembly modeling. It provides for rapid navigation of the assembly hierarchy and allows direct access to the design model of any component or subassembly. It supports the “design in context” approach where changes can be made to any component of the design model while working in the context of the assembly. 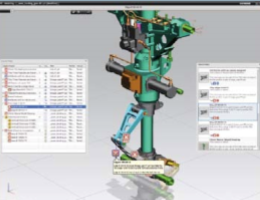 NX Mach Series Design includes tools for building and manipulating assembly structures. The use of interpart relationships enables the creation of parametric assemblies which capture and preserve the designer intent whenever changes are made. Assemblies can be easily traversed using the assembly navigator in conjunction with intelligent component searching capabilities. NX assemblies also include support for the creation and use of flexible assemblies and parts enabling different sizes and configurations of components such as springs and pistons. The advanced assembly modeling capabilities in NX Mach 3 Product Design enable you to simplify components or subassemblies into a single lightweight solid, to enclose assembly geometry in an envelope of planar faces, to partition assemblies into meaningful regions, and to manage weight and other mass properties of components and assemblies. 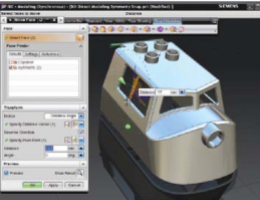 Extends the toolset for building, editing and evaluating assembly models. It is especially useful for users working with large assemblies, but it also helps improve the productivity of most users who work regularly in an assembly context. Component filtering techniques allow users to quickly identify and load the components of relevance to their current task, avoiding unnecessary delays and screen clutter caused by loading irrelevant components. Active mockup also provides extra flexibility by embedding the de facto standard JT™ data format into NX. This improves the performance and memory efficiency of loading and designing in the context of massive assemblies. Assembly enveloping techniques enable the user to represent major subassemblies as simplified abstractions to further reduce assembly load times and avoid the display of unwanted or proprietary interior detail. The sophisticated clearance analysis and weight management tools provided in advanced assemblies are also optimized or analyzing potential problems with fit, clearance and mass properties. Provides the shape modeling application that supports the creation of complex surface and solid models. Extends surface modeling to include complex filleting, blends and transition surfaces. Guided assistance accelerates the creation of solids from sheets, and the software also helps create surfaces from external point, poles and point cloud data. It includes general-purpose design and manufacturing sweeps and flanges, including dynamic law extensions, silhouette flanges, ribbons and sectional sweeps. Designers can shape surfaces by direct point and pole manipulation, and with boundary, degree and stiffness controls. Surfaces can be trimmed, extended, offset, combined, divided or enlarged. Advanced surface analysis tools provide real-time graphical feedback that assists in analytical and visual evaluation of surface quality. Enables designers to create conceptual surfaces for quickly capturing initial design intent, as well as creating and editing curves directly on surfaces. It has direct surface modeling capabilities that maintain associative surface boundary controls ranging from G0 to G3. Styled sweeps associatively sweep profile curves along multiple guides, and advanced surface trimming creates cut surfaces independent of original surfaces. Provides a solids-based application that is focused on design for manufacturing of sheet metal parts. Users can create sheet metal component models using feature-based design tools for tabs, flanges and other typical features. They can define forming tables and bend sequence tables, and reform the solid model taking into account material deformation properties. The sheet metal tools generate accurate flat pattern data for downstream applications from solids, sheets and wireframe geometry. Provides an environment that facilitates the design of both flexible and rigid printed circuits. Based on workflows common to the design of printed circuit boards, NX Flexible Printed Circuit Design helps designers model printed circuits rapidly and accurately in the context of an assembly and send the outlines to manufacturing or to an ECAD system for further refinement. The printed circuit model developed in NX can be checked for clearances and tolerances, and then the finished board model can be transferred to an ECAD system for further refinement, such as component placement or circuit trace or layer development. Includes tools to automate and streamline engineering drawing production. Drawings are associative to models, so model changes automatically update and are reflected in related drawings. Drafting capabilities include dimensioning, symbols, tabular notes, sheet layout and placement of standard orthographic and auxiliary views, automatic view creation from the 3D model, hidden line processing and automatic parts list generation. Templates that include drawing borders and view layouts can be dragged and dropped into models to automate much of the work associated with manually created drawings. Drafting tools can be configured to comply with the drawing standard selected by the user – ANSI, ISO, JIS, DIN, GB and ESKD. Allows an organization to store all manner of geometry, tolerance and dimensioning information directly within the 3D model, rather than on a 2D drawing. NX offers a 3D annotation tool that captures and associates product and manufacturing information (PMI) to the 3D model, and which complies with all the major concepts and requirements defined in the standard for 3D product definition (ASME Y14.41 and ISO 16792 TC 10). PMI supports the creation of dimensions, tolerance features, weld and surface symbols, material specification notes, part identification labels and a number of other manufacturing and process-related annotation. Because the PMI is created in the 3D CAD model and directly associated to objects in the part, the information can be easily re-used by a number of downstream processes, from the 2D drawing to final article inspection and buyoff. Incorporating PMI during the design process can enhance and shorten the design cycle through better communication, fewer errors, streamlined design and manufacturing processes and faster change management. Provides the integral component of any 3D annotation environment that supports the creation of standards-compliant GD&T symbology. PMI in NX provides GD&T 3D annotation tools to create datums, feature control frames and geometric dimensions and symbols that are compliant with industry tolerancing standards. The GD&T functions are contained in every PMI license. Poor quality geometric data imported from other systems is quickly uncovered and remedied before it becomes a larger problem (for example, mismatched edges, tiny gaps in faces and nonmanifold conditions common in lower-precision modeling tools). Companies can use the validation checking results to establish product quality metrics and pre-emptively head off quality issues in the earliest stages of the development process. Validation checks embedded in a design can also help notify a designer if the value of a model expression ever strays from within appropriate limits. These validation checks can be created on-the-fly or can be linked to external sources of design requirements, such as Excel spreadsheets. Enables designers to check the draft of a part, even if they know virtually nothing about mold design. NX analyzes parts and automatically provides designers with information about draft angles, undercut areas, sharp corners, small radiuses, etc. It provides designers with an easy visual check of core and cavity sides that does not require any special analysis or knowledge of mold design. By detecting errors early, designers can avoid the time-wasted back-and-forth that occurs when the tooling department or supplier discovers that a part can not be molded as designed. Helps users understand which design parameters are really key to their design objectives. Users identify candidate variable design parameters and a design goal. The wizard then applies sensitivity and filtering tools together with engineering constraints to identify the more critical design parameters and then optimize them. The step-by-step wizard provides design engineers with a method to ensure that their product designs are fully optimized to best meet their design goals. It also lets designers and engineers capture engineering requirements, automate the exploration of design alternatives and automatically identify optimized solutions. Provides data exchange capabilities that include the most commonly used translators needed to bring data into and out of NX including IGES, STEP AP203, STEP AP214, DXF/DWG and 2D exchange. These translators include geometry repair and simplification capabilities to ensure the most useful data possible. All of the translators can be run externally from NX or directly inside NX from “File Import/Export” and “File Open/ Save As” or from the command line, making them customizable to any workflow. Provides collaboration functions, powered by Teamcenter software, that enable customers to share designs, hold working design conference sessions and conduct design reviews. For ad hoc design reviews, packaged files of lightweight design models and related documents are created and then can be distributed via e-mail and viewed outside the NX environment with the XpresReview viewer. 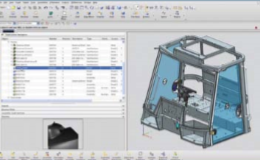 Enables users to publish design data to the web with an HTML publisher for creating detailed documentation for component parts or assemblies based on information in NX part files. Web publishing uses template files that contain both HTML and special NX embedded commands. These commands extract information from a design file and write it to an HTML file that can be read universally. Enables users to automatically output/export model data in faceted STL format used with rapid prototyping technologies, such as stereolithography and fused deposition. This capability reduces turnaround time regardless of the specific rapid prototyping technology employed. Enables all NX Mach Series solutions to run custom programs that were developed with the NX Open software development tools. Enables Mach Series, 1, 2 and 3 to run applications created with Knowledge Fusion, Siemens’ knowledge-based engineering package and programs created with Siemens’ process studio wizard building tools. Delivers a Teamcenter-powered foundational product data management system integrated with NX Mach Series 1, 2 and 3. It provides basic vaulting, file check-in/check-out and is an integral component of NX solutions. Engineering process management enables users to organize and protect all product data (models, drawings, associated documents), as well as to save time they spend searching for product data. It also helps design teams coordinate the work of team members. Do you have an office in the United States?